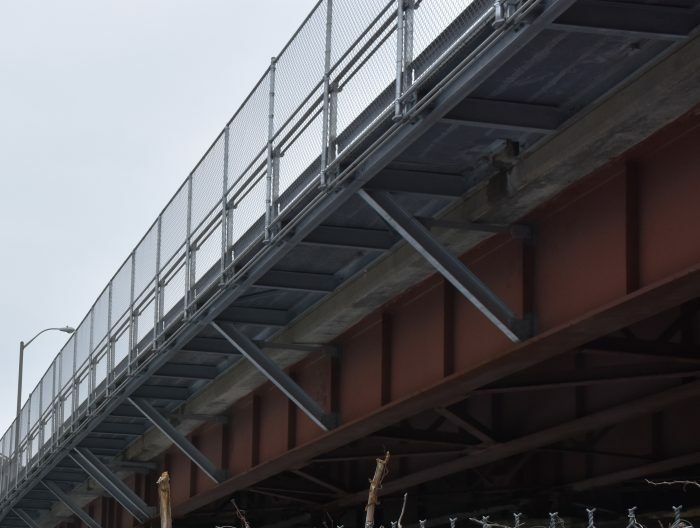 DAYTON, Ohio : When deterioration forced the State of New York Office of General Services (OGS) to close a downtown Albany pedestrian bridge walkway, the crew chose to replace bridge components and enlarge the sidewalk. The pedway supports daily foot traffic of nearly 700 state employees and links agency offices with parking. The OGS crew considered traditional concrete and lightweight concrete but both options proved too heavy for the vehicle bridge. And internet search led OGS to Composite Advantage’s Fiber Reinforced Polymer (FRP) FiberSPAN-C cantilever sidewalk system. The FRP composite pathway is the only product that provides pedestrian access without exceeding load capacity. FiberSPAN-C panels are 80 percent lighter than reinforced concrete panels. And because the cantilevered sidewalk is prefabricated, construction is quicker and installation costs lower. FRP’s corrosion resistance to chemicals and water means zero maintenance for a structure that will last nearly a century. Uniform live load was 75 psf with mid-span deflection limited to L/400. Wind uplift load was 30 psf. Dead plus live load bending strain was limited to 20 percent to ensure a strength safety factor greater than 5. Thirty-six prefabricated FRP panels were delivered to the work site. The FRP cantilever sidewalk was fastened to supporting longitudinal steel beams with connection clips bolted into steel plates embedded inside FRP panels. Installation took approximately four days. The FiberSPAN-C walkway was 763 ft. long and 64 ¼ in. wide. Deck thickness was 3 7/8 in. with 1/8 in. wear surface for a total thickness of 4 in. A non-slip polymer aggregrate overlay was applied by Composite Advantage’s factory to enhance pedestrian safety. The FRP sidewalk re-opened in November 2017. Composite Advantage is an engineered solutions supplier of innovative Fiber Reinforced Polymer (FRP) products for major infrastructure markets. CA’s unique technology approach pairs progressive designs with its capability to mold large parts, perform on-site assembly, and support customer installations. Since 2005 CA has developed lightweight, high-strength, cost-effective FRP goods for structurally demanding applications and corrosive environments. The commodities have seen first-time use of FRP composites in a number of infrastructure, rail and water applications because of their performance attributes. The advanced materials manufacturer offers a comprehensive menu of products ranging from bridge decks, trail bridges, cantilever sidewalks and rail platforms to fender protection systems, pilings, naval ship separators and other waterfront structures. Visit www.compositeadvantage.com or contact Composite Advantage at 937-723-9031 or info@compositeadvantage.com.